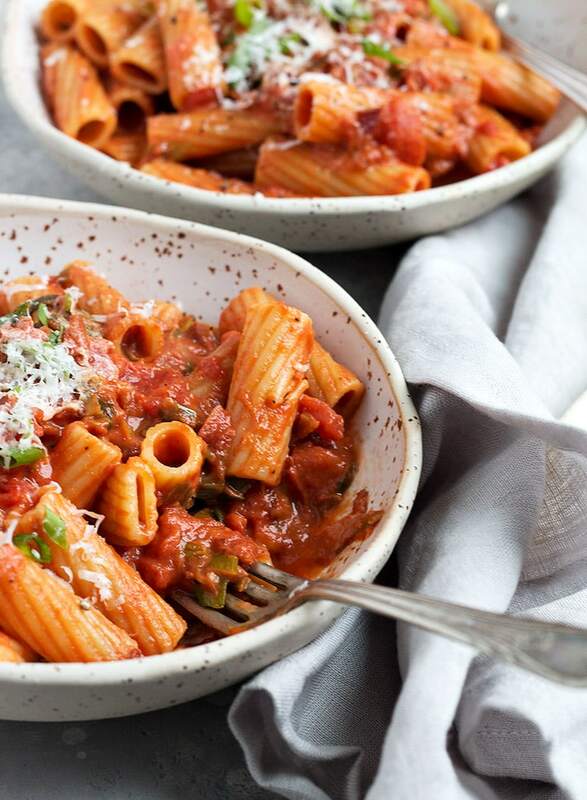 This Rigatoni with Green Onion and Pancetta Tomato Sauce is a fast, easy and delicious pasta dish, perfect for busy weeknights! This pasta is a re-creation of a dish I recently enjoyed at a local restaurant. Yes, I’m a serial re-creator! I was intrigued by the addition of green onion and I discovered that green onions and pasta make a perfect pairing. Who knew? I’d never considered green onion with pasta, at least not in a starring role. It was a revelation and with every bite I just knew I’d try my hand at making this dish at home. I make pasta a lot for dinner. I’m sure that comes as no surprise to any regular reader of this blog. After all … I live for Carbs! That said, I’ve never been 100% satisfied with the tomato-based pasta dishes I make at home. They always seem to be missing the richness and smoothness of restaurant dishes. Then I read a little tip online recently that suggested adding butter. Say what? Yes, butter + tomatoes = an awesome pasta dish. Uh huh. It seems that the butter works to knock back the acidic tomato taste, leaving just the richness and smoothness of the tomatoes that I was after. In this dish, the vodka also works to heighten the tomato flavour. In fact, that’s it’s only role really, since vodka adds little in terms of taste. 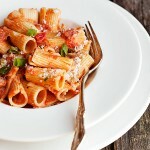 The pairing of the pancetta and the green onions really shines with the creamy tomato sauce. There is only a bit of cream in this one – just enough. 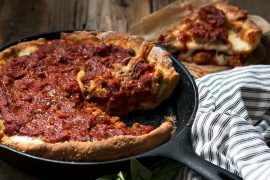 You can adjust the amount of red pepper flakes to your taste, or skip them altogether, if you don’t want any heat. The vodka itself will cook off completely (the alcohol, that is) and leave behind just a tiny bit of flavour. If you’d prefer not to use alcohol or you don’t have any one hand, just skip it. I regularly make this dish for my vegetarian daughter by just omitting the pancetta. And it’s still delicious! So don’t hesitate to make this one meatless. 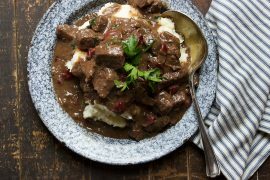 This is a quick, easy and delicious weeknight meal. In a pinch, you can substitute bacon, but pancetta is worth picking up for this one. Boil a large pot of water and salt generously. Add pasta and cook until al dente. Meanwhile, pour canned tomatoes into a bowl. Break the tomatoes up with your hand and discard any tough ends. Dice your pancetta and green onions and set aside. In a large skillet over medium-high heat, cook pancetta until browned. Remove to a bowl. Add green onions and cook, stirring, until softened and starting to brown (there should be a bit of fat from the pancetta in the pan, but if not, add a bit of butter). Add the chili flakes and cook briefly. Add vodka and cook off until only a few Tablespoons of the vodka remains. Add the tomatoes. Reduce heat and simmer for 10-15 minutes. Add the butter, sugar and salt and pepper, to taste. Add the cream and stir to combine. Reduce heat to low until pasta is ready. When pasta is cooked, drain and return to pot. Add sauce and cook, stirring, about 2 minutes. If necessary, add some pasta cooking liquid to loosen the sauce. Serve with additional fresh diced green onion and Parmesan. Pasta with goat cheese is always a good thing! With cherry tomatoes and spinach, too. 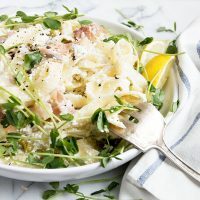 A lovely pasta, with fresh lemon flavour, greens and prosciutto. 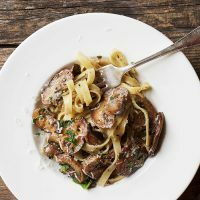 A great pasta for mushroom lovers! I made this for my wife and I tonight for dinner as a first plate. Made it exactly as recipie the only change I made was instead of draining the pasta I scooped it out of the pot with a large slotted spoon and right into the pan with the sauce. The presentation with the green onions as a garnish made it look wonderful. Adding the butter is smart and exactly what you said about how the tomatoe flavour will come out better. 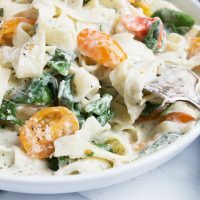 I have made and do make many different versions of pasta sauces and have to say this one stands up well and so easy to make the whole dish was completed in less then an hour. I would if you don’t mind cut the the cream in half as it did come more rose. I am very happy to have found and subscribed to your blog . You make me look good. So glad you enjoyed it, Pat! This one is in regular rotation here, as it’s just so easy and tasty. And I always seem to have green onion in the fridge :) Thanks! I love that you recreated this so I could cook and taste it myself, even so far from Ontario :) Sounds delicious! I love the science behind the butter and the vodka, the green onions and what they bring to this dish. Pasta is the best dinner! I know. 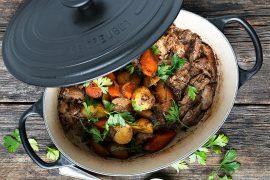 Isn’t the internet great that we can share recipes so far and wide?! This looks great. 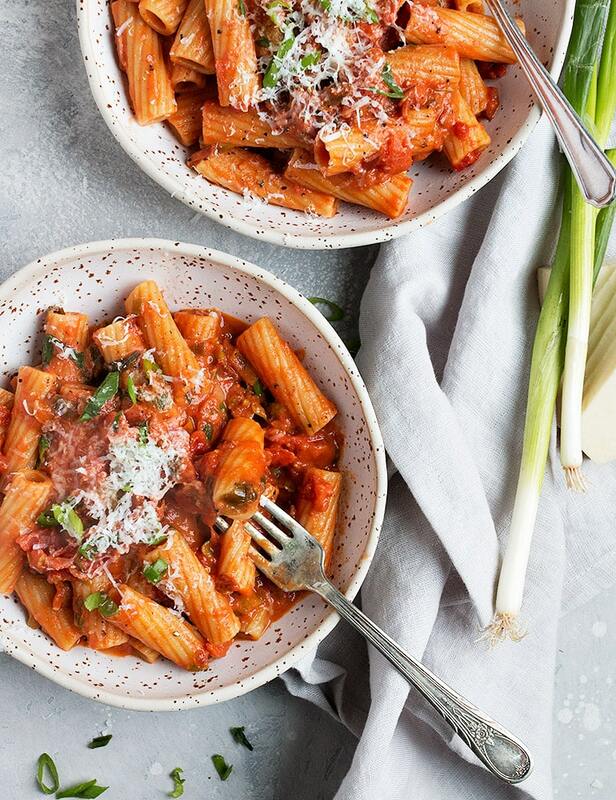 I once had a vodka sauce with pasta in an Italian restaurant and have always wanted to try one at home – it is great to have a recipe idea. Thanks for sharing. Vodka sauce is one of my favourites. Hope you get a chance to try it. This does sound good…I’ll have to check out that restaurant next time in that area! Thanks Liz. I definitely recommend Grazie. Great pasta and the pizza looked great, too! A good pasta sauce is essential. Thanks for the timely reminder about vodka sauce. 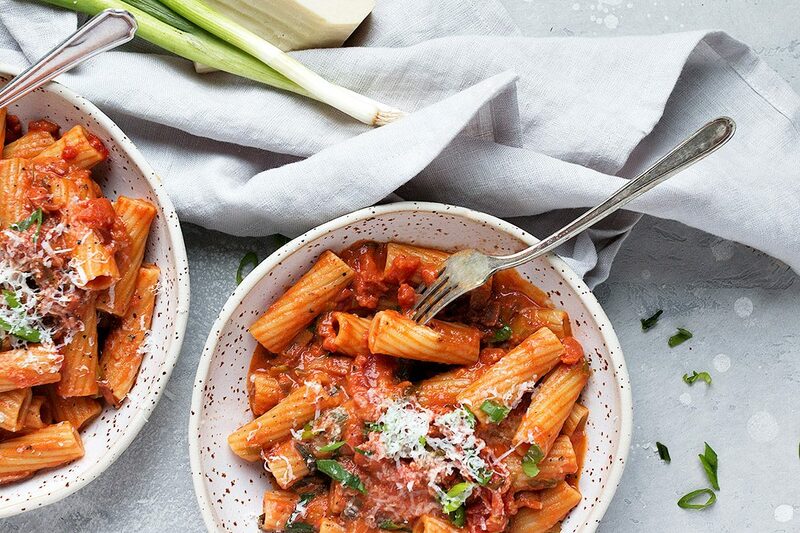 Vodka sauce is one of my favourites, for sure. The vodka really does heighten the tomato flavour. I love vodka sauce, such a gorgeous plate of pasta! Thanks Laura. It was delicious! Looks tasty!! There is a Grazie near my apartment on Yonge – the pasta with rosé sauce, pine nuts and raisins is AMAZING and has been on my list to recreate since I tried it a few months ago!